The survey element of this project comprised three years work in specific areas covering the whole of north-west Wales, first Meirionnydd, second West Conwy and North Gwynedd and lastly Anglesey and West Gwynedd. Each area was surveyed and a report for each completed in the same years as the survey (Smith 2001, 2002 and 2003a). Subsequently publication reports were prepared summarising the work in each area (Smith 2003b, 2004a and 2004b). In 2004-5 a small amount of follow up work was carried out. This was in two parts. First a trial synthesis of the project data for the whole of Wales, with a view towards eventual analysis and publication. Second a topographic survey project to provide a background information for an area of environmental study being carried out by Astrid Caseldine at Waun Llanfair, Llanfairfechan, close to the well-known Druid’s Circle complex, an area of intense prehistoric funerary and ritual activity. A study was carried out of the project databases produced by each of the Welsh Archaeological Trusts. This involved the complete databases of GAT and GGAT and sample areas from CPAT and ACADAT, whose surveys were still ongoing. The main aim of the study was to test whether the data from the four WATs could be brought together and analysed for an eventual final synthesis of the project for the whole of Wales. A report was submitted in April 2005 (Smith and Steele 2005). The four Trusts use a common project methodology, developed by CPAT, but the software used for the data entry and the definitions of the data fields vary. However, it was possible to extract the data, incorporate them into a common table and, using GIS to produce trial distribution plots of monument types for the whole of Wales, for those parts of the available data. Recommendations were made to ensure that the remainder of the data could be synthesised, particularly that the original methodology should be adhered to, but that database field definitions should be agreed and made compatible. It was suggested that an eventual report of the whole of Wales should produce overall distribution plots and statistics and reproduce the data in way that can be used by other researchers, such as on data disc. The report should also consider wider research problems such as the interpretation of distributions by site type and period, topographic locations and site orientation or aspect, where available. It should synthesise existing artefactual and dating evidence and identify wider research objectives. It was suggested that for other future projects a common relational database should be used with the aims of the final synthesis set out from the start. This work was carried out a part of one of a number of palaeo-environmental case studies being carried out as part of the pan-Wales project. 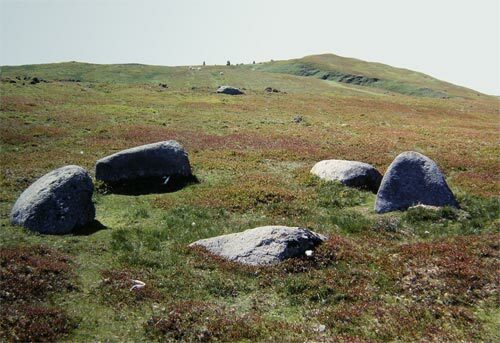 The Waun Llanfair basin is surrounded by groups of cairns and there are three burnt mounds and other possible evidence of settlement in the area. The basin is marshy and was identified during the survey as having good palaeo-environmental potential. Subsequently two soil pollen columns were taken by Astrid Caseldine. These showed good preservation of pollen and radiocarbon dating showed that the columns covered the general period in which the cairns and other funerary and ritual monuments must have been constructed and used. The survey aimed to provide a better record of the area and was carried out in conjunction with John Roberts who is studying the area in more detail as part of a PhD project. The location of the pollen cores previously taken were plotted by total station and related to cross and long transects of the basin, showing the existing land surface and the depths of peaty silts in the basin, i.e. showing the height of the underlying land surface, obtained by probing. These show that the peaty silt development in the basin is fairly even, with no areas of particularly greater depth, such as infilled palaeo-channels. Further detailed total station survey was also carried out of three areas of funerary and ritual monuments identified during the original survey in 2001 as well as a burnt mound, two ‘wandering’ walls and three possible settlement areas.